Military Cemetery/Memorial / Fynwent milwrol: Duhallow A.D.S. Cemetery Ypres. He is listed in De Ruvigny’s Roll of Honour which gives a short biographical account of which the following is a summary. His parents were George Edward Trevor-Roper of Rhual Isa, Mold and his wife Harriet. Charles was born in Mold on the 9th February 1884. 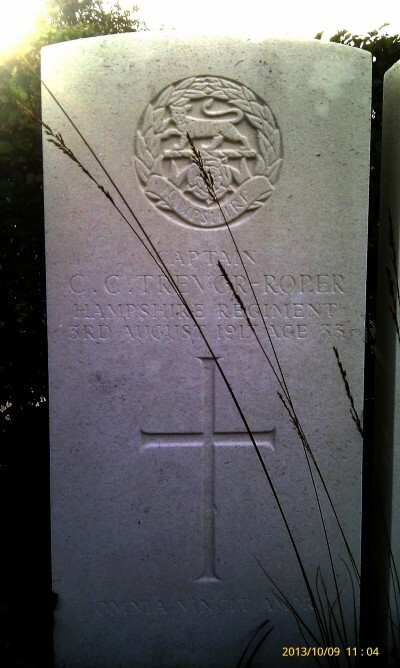 In 1901 he succeeded to the Plas Teg Estate on the death of his uncle Colonel Charles James Trevor-Roper. He was educated at Bedford and at Clare College Cambridge. This is the really interesting part! He was a student at the Acadamy of Dramatic Art in Gower Street and he played in London under the renowned H.B Irving and went on an Australian tour with his company in 1911. He had married Gertrude Alice Clabby on 8th April 1913 in Enfield, London and had three children Elizabeth Alice, Richard Dacre and Anne. Gertrude’s father had been Asiistant Inspector General of Bombay District Police. His brother Geoffrey was also killed – only weeks later. 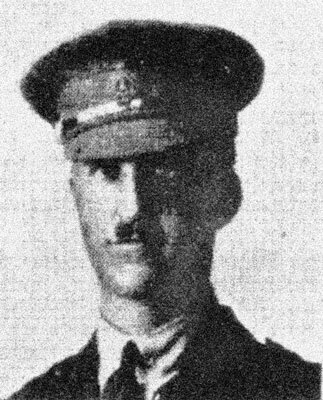 He died on 20th September 1917. He has his own page on this website.